Overall it did great, no complaints at all out of a stock rig. 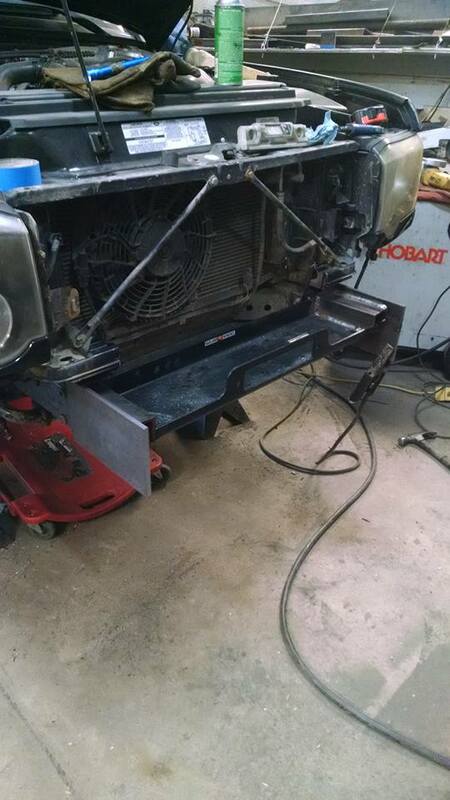 Looks like I'll be making some bumpers and skid plates though, then a regear, lockers and a lift. I really love my Discovery for off road. I have a 98 though. Got the winch, skid plating, lift, and roof rack. I've taken the Range Rover off road. And while it is great, I prefer to keep the off roaring to novice type trails in it. 98 Discovery LE Tdi 5 speed, Warn winch, OME. We have always had Jeep wheeling rigs, but I have hd my eye on the Disco II's for a while. Whilst in Ca visiting my Mum, Cheryl bought this example and drove it back. I gave my wheeling rig (98 XJ on JK 44's, 37's, and so on) to our eldest as a graduation present, and it left us without a viable wheeling rig that would fit 4 comfortably. Good news is I can make the bumpers etc myself. Axles I am not sure on yet. Either build the Rover ones, or go Toyota axles front and back. Will start doing some reading and see how the stock ones will last with chromo shafts and new differentials. Hey, there was a perfectly good trail just to the right of you! Were they laughing with you or at you? Sounded like a fun day out for the family! Don't discount the P38 for offroading! I originally was shopping for a disco when I bought the rangie instead. But there are a lot more off road accessories available for the discos. Did a little Oopsie thpough on a rather large rock. Now deciding to either build the axles, or just drop a pair of FJ80 axles under it. Want to be running 35's reliably eventually. ^this vehicle deserves to be seen in full view! I love the Disco! Well the $2500 was not delivered, so will be looking elsewhere. Can keep looking when I get back to work too. For axles that are strong, already geared, full floating in the rear, and have selectable lockers, they are hard to beat though. Will also make finding wheels a breeze, Yota wheels are all over, but LR wheels arent. I looked at some steel Disco wheels, and the prices are 110% idiotic. Why people pay for that over here is beyond me. Back home they are all but free..... Same as Defender stuff I guess. The last one I had back home, I gave away because the t case had screwed up. Over here it would sell for over $20k regardless....For a tractor? No thanks. sliders or a roof rack to tie Cheryl to. And Cheryl said.......Nah I wont repeat it Carl! Front bumper is also off, along with crash cans etc. Winch is offered up (I borrowed one for mock up) so now it's just a case of designing something we (well OK, Cheryl) likes. Sliders done,obviously as that was days ago! Immediately moved to the front bumper after the sliders. After some deliberation and coffee, I decided on this plan of attack. 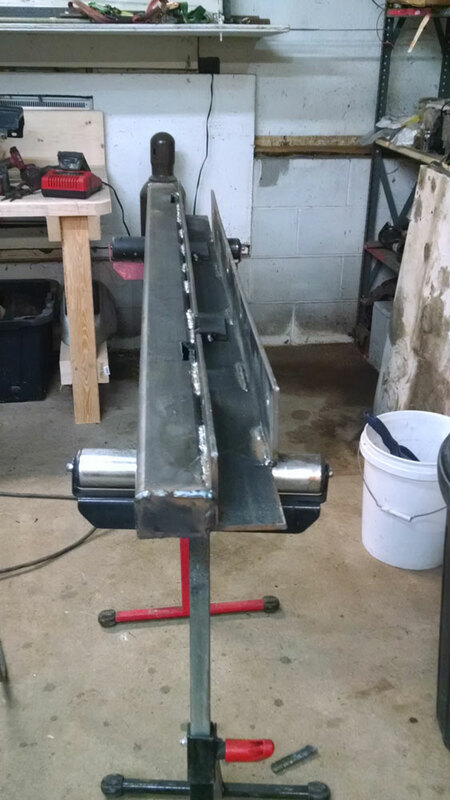 Make side rails from 3/8" x 6" flat stock, and use that on the outside of the frame rails. 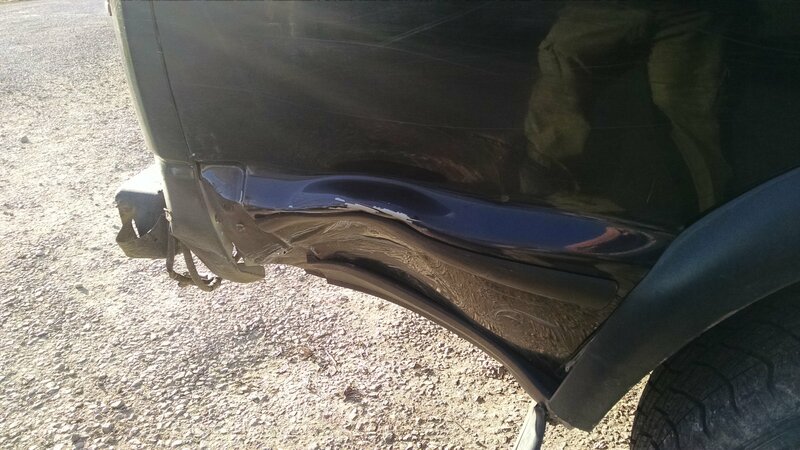 Passenger side goes back @14" from the front edge of the frame. Driver side goes back to the steering box mount. 9 bolts holding it on thus far. 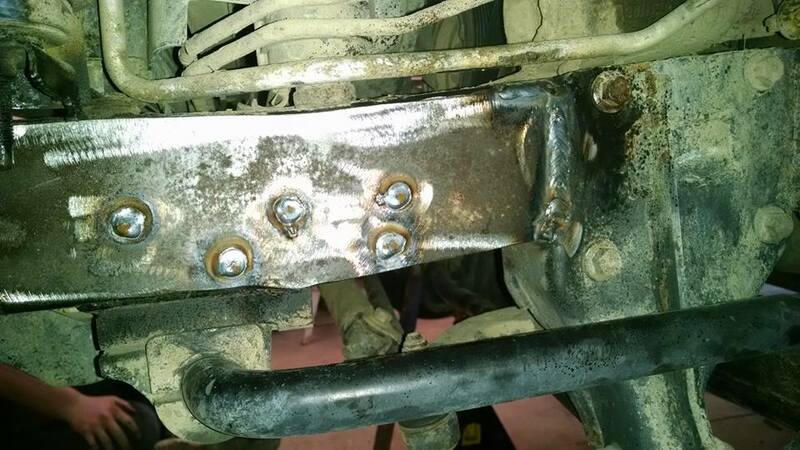 Prepped the frame rails, then welded on some 1/8" flat stock to level the frame rail to the steering box bracket, and to beef up the frame a little. 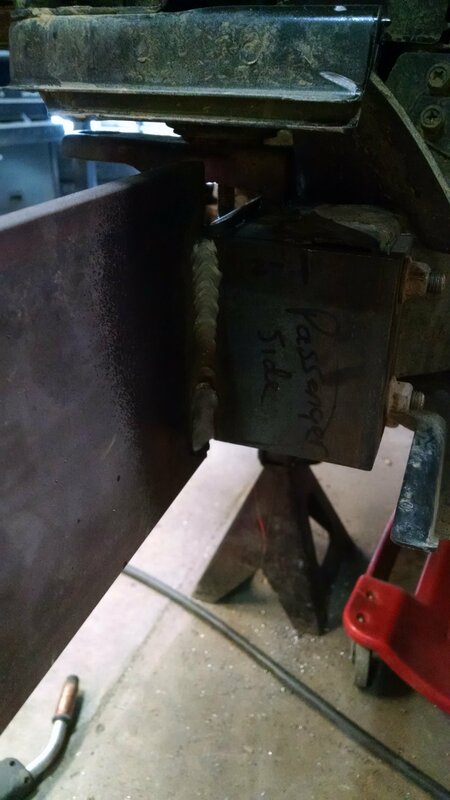 The passenger side has a 1/4" plate on the inside, for the bolts to go through and sandwich the frame. Front of the frame has some 1/4" angle to go from the inside of it, to the outer rail. 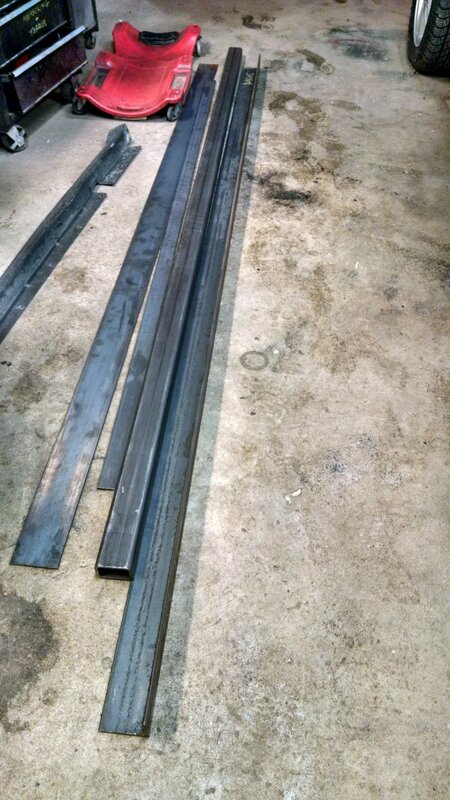 Then reinforce and weld it all up. The front is done, now just to make it look all purdy and box it in etc. 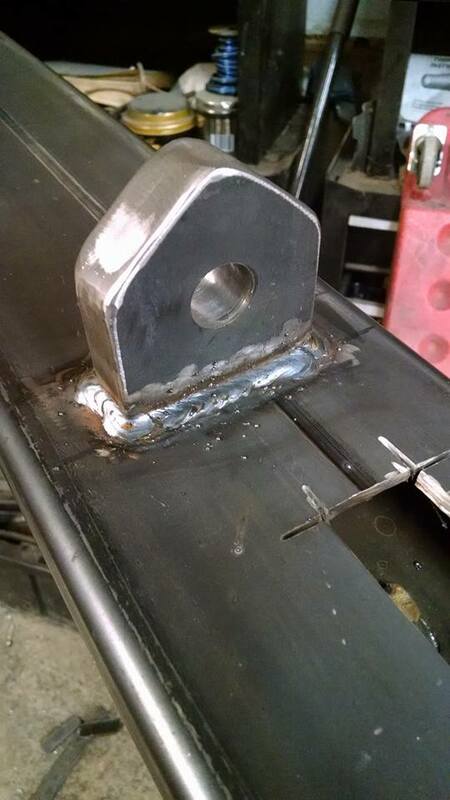 1" thick clevis' are welded to the 3/8" AND bolted using 2-1/2"x13 grade 8 bolts. 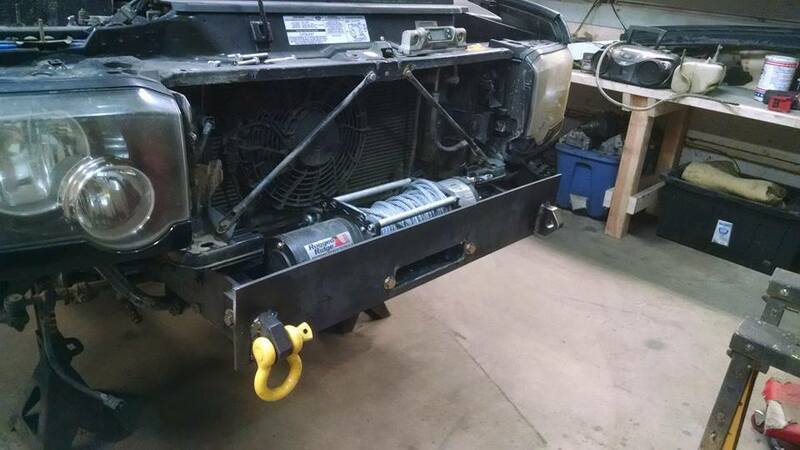 Got the winch tucked in nicely by "modifying" a little brace.....Well OK, I plasma cut it off LOL. 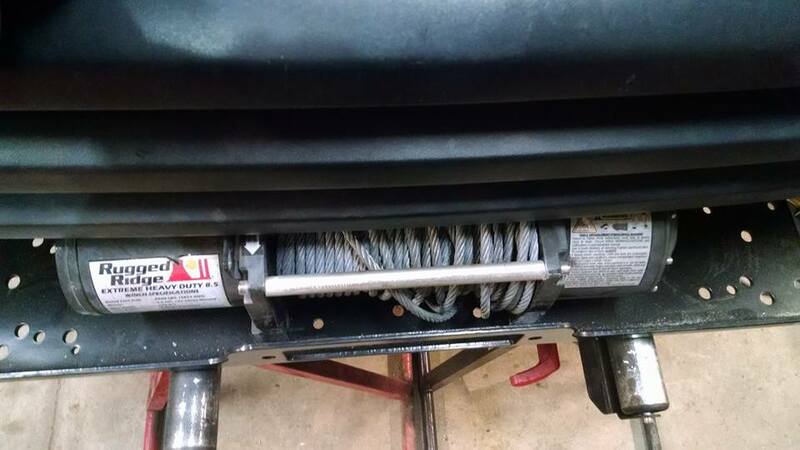 The winch tray and brackets will easily replace the sheet metal brace though. Ok, the only sliders I know are cute little tasty burgers! 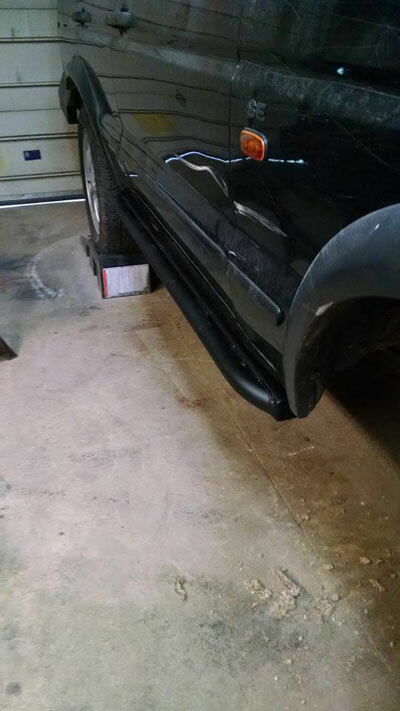 Are the sliders added for reinforcing and protecting the lower sides and/or underbody? Allowing you to "slide" over an obstacle, instead of getting caught up in it? Possible new Toy - thoughts?